A little bit of plotting. So last saturday dawned bright and relatively warm so I decided to go up the allotment for a little while. My main desire was to give the bee plot a haircut which I achieved in record time and so had a cuppa afterwards and then set about cleaning up the greenhouse which I didn't get touched at the end of last year. As you can see above my newly purchased greenhouse from last year didn't make it through the storms. This was a real shame. 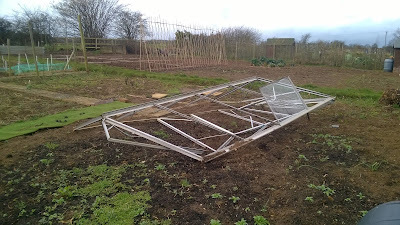 I am thinking that something must have got blown across the allotment and hit the framework as there wasn't any glass in ti the wind technically should have whistled straight through. The frame was weighted down with some slabs to stop it moving. It's a shame but 'hey, ho', life goes on and all that. On the plus side I now have plenty of spare glass for repairs for my current greenhouse...always got to look on the bright side of things!! Apparently I haven't got any better with posting...really need to keep working on that...I'm thinking I may be better writing my posts on a weekend and then scheduling them to publish through the week...I'm having some theories here...lets see if I manage to put them into practice and keep to it!! Right now as I type I know I have posts to share.....I just can't remember what I have taken pics of....guess i'll have to go back through the camera and write a few more!! So I'm sure I'll need to purchase seeds and I know I need compost, I will slowly after much aching become summer fit in time for the sun to shine and the bees to buzz in earnest. They enjoyed the past weeks weather but are very quiet today. I really want to get in and give them a good inspection...but until the temperature warms up and the wind drops it can't be risked....I do hope it warms up enough soon!! In my absence we also had Polly spayed. We didn't want any puppies and certainly didn't get her for a breeding machine to make us money so off to the vets it was. She was a little star when she came home and now after two weeks is finally allowed off lead again. 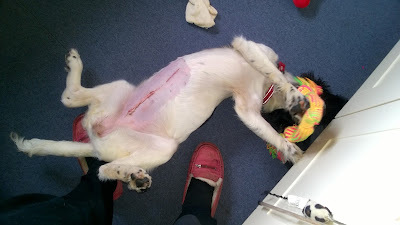 Above you can see her wound, it has healed lovely and she was an absolute star with it not having to wear the collar even once!! Her fur is slowly growing back and she is enjoying being able to stretch her limbs over the fields once more!! So in this post I don't really have much else to say...if I keep waffling I won't have anything to write to be published later in the week. Here's hoping you all have a wonderful weekend!! What a shame about the greenhouse. Was it beyond repair? Definitely beyond repair Sue. Still waiting to be removed. On the bright side...I have plenty of spare glass!! Too bad about the greenhouse. I often procrastinate on getting my posts ready even though I do post almost every day. There's just so much work involved with getting pictures edited and resized. I'm really lazy when it comes to my pictures Ann, just let blogger do it's best...maybe I should think about making them a little better some time!! Glad Polly is ok. I have 2 girls, can honestly say I don't make any money breeding, they've been costing me more with vet bills then they would make, especially when they don't then get pregnant. Shame about the greenhouse, I've never seen anything like that before, something must have been blown into it to bend like that. I've always been bad with keeping up with the blog so don't worry, NY resolution is to try & keep up with it.